On the July 1 episode of Raw, WWE highlighted past WWE and World Heavyweight champions as they counted down to the main event between John Cena and Alberto Del Rio. One of the packages featured Sting. He and Lou Thesz are the only two wrestlers in those pieces who never wrestled in the WWE. Thesz is now deceased, but I would imagine at some point he'll be inducted into the WWE Hall of Fame. The inclusion of Sting in the champion series has led to speculation that the former WCW champion is headed north from TNA. 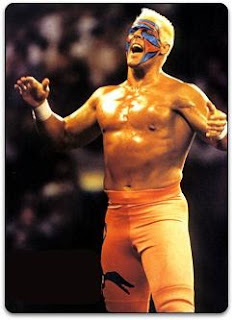 Sting is already a member of the WWE alumni site, although he's never set foot in the company's ring. He's without a doubt the biggest name to have never signed with the WWE. As a teenager, I was shocked when guys like Harley Race, Dusty Rhodes, Ric Flair, Lex Luger, Arn Anderson, and Tully Blanchard all made their way to Titan Towers. For whatever reason, Sting never went, even after Vince McMahon bought WCW in 2001. At age 54, clearly Sting's best days are behind him. That being said, I would still MARK OUT if he signed with the WWE, even if for just one match. I'd mark out even more if he wrestled it as "Beach Bum" Sting. While I wouldn't want to see him get a championship run, I think it would be fun to see him have a few matches and eventually retire and go into the WWE Hall of Fame. But part of me also finds it cool that he's really one of the only guys to never work for the WWE in some capacity. However, the mark in me wins out and yes, I'd like to see at least one match in a WWE ring featuring the superstar from Venice Beach. I do know Sting extended his contract with TNA back in March 2012. I don't know how long he extended it for. I have learned as a fan, never say never. I wouldn't be surprised to one day see Sting on WWE TV and wrestling at a Wrestlemania in the near future. Thoughts? Share them here or post on Facebook.